Just before last weekend I received the very last sample available from Macallan of the whisky released for the Royal Wedding this weekend. So I settled myself down with a glass and began to taste. Cinnamon, ginger, clove, toffee apples, layered in vanilla. Chocolate orange flits in and out, along with summer fruits. Lightly floral and barley notes all come together in a delightful creamy overtone. These were aromas over the first few minutes of opening. Having left the whisky for 20 minutes further to open up I also found Caramel, Cedar, Aniseed under flavour and sweet Rose Petals topping the floral notes. Abundant wood spices deliver an initial hit to the palate, giving a slightly oily texture. Fruits develop, balanced with soft oak tones. Orange zest, floral notes and barley all make an appearance later in the journey as do crystallised citrus fruits. Soft, full, long lasting giving way to a clean spirited end. 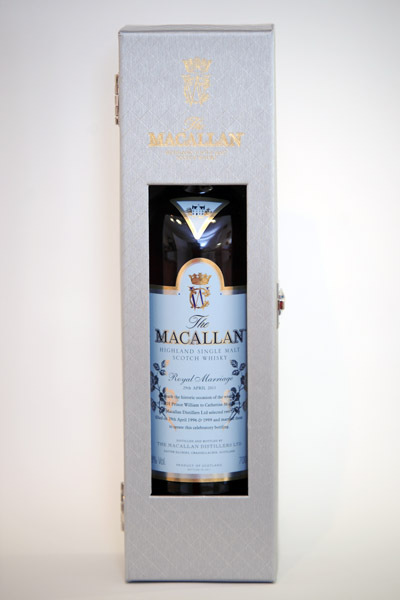 As the excitement mounts for the first Royal Wedding in 12 years, The Macallan has announced the release of a limited edition of 1000 bottles celebrating the Royal Marriage of Prince William to Catherine (Kate) Middleton on29th April 2011. The collectible status of this whisky is already starting to show. With the 1000 bottles released selling very quickly, bottles of the whisky are already on the secondary market, such as Ebay. Bottles have selling for as much as £450 three times it’s original price. 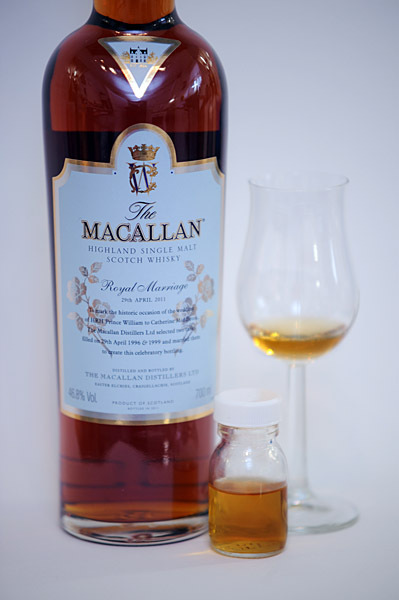 With great interest in people collecting Macallan and those interested in ryal wedding memorabilia especially with high demand from outside the UK, it is clear to see this whisky demanding a high price once it finds it’s way onto the secondary retail market, and even then may still be collectible as an investment as demand for such a rare and good whisky continues. I hope some gets drunk and enjoyed, especially over the Royal wedding when it looks as if a little warming drink during the showers forecast for Saturday might not go amiss! There is a little help detecting the fraudulent bottles which may come on the market in the future. 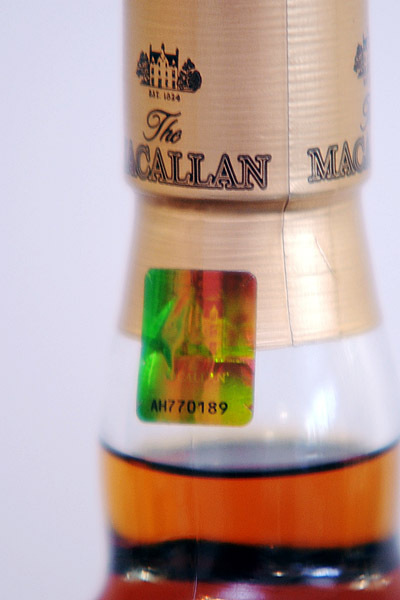 Macallan have placed a little metallic holographic sticker on the bottle on the edge of the foil, it has an image of Easter Elchies House as the hologram.